Dentists treat cavities every day using advanced restorative dentistry procedures. The team at our Hartford dental care center always ensures the right treatment is used to address the patient's needs. When it comes to cavities, that means recognizing the stage of tooth decay the patient suffer from. 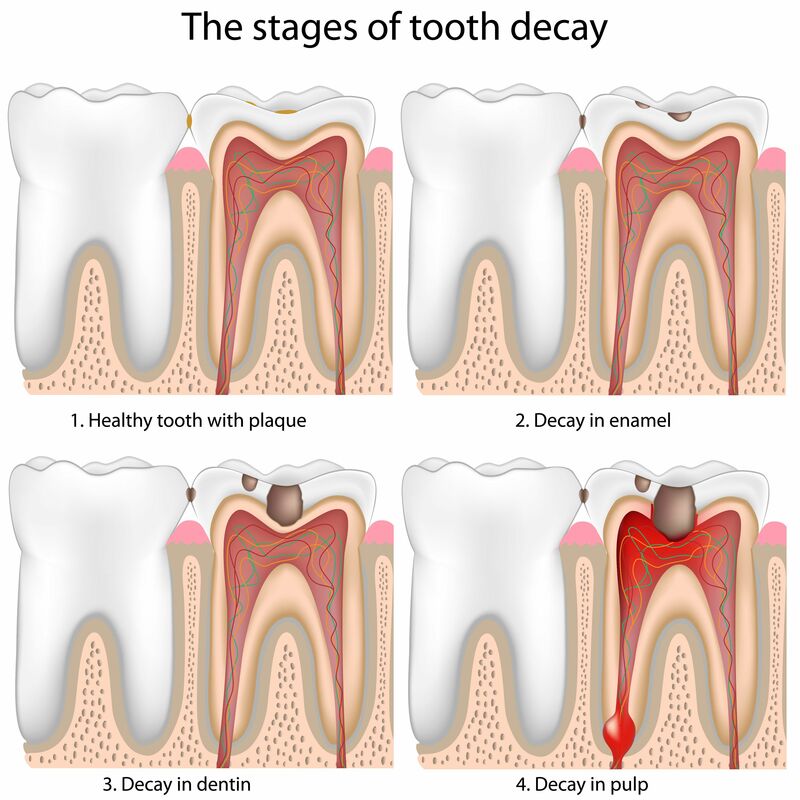 Let's take a moment to consider the various stages of tooth decay and what treatments are available to address them. The first stage of tooth decay is an initial lesion forming on a tooth. This typically shows up as a bit of white or brownish discoloration on the tooth's surface. While this does not show up as a cavity on dental x-rays, it is the first sign of tooth demineralization at the enamel level. Thankfully at this early stage of tooth decay, the damage can be undone and reversed. Dentists may recommend fluoride treatment, the use of dental sealants, and other options to promote remineralization. Patients will be encouraged to brush and floss diligently to help with the process. At the second stage of tooth decay, the tooth enamel has begun to break down. While tooth enamel is one of the strongest substances in the entire body, it cannot withstand the effects of tooth decay for long. With the enamel breached, people are likely to experience tooth sensitivity, particularly when having food or beverages that are hot/cold in temperature. The ideal treatment for decayed tooth enamel is the use of a dental restoration, such as a dental filling. This helps replace the compromised tooth structure, allowing patients to bite and chew normally without discomfort. Beneath the tooth enamel is a porous substance known as dentin. Tooth decay travels much faster through the dentin because of its porous nature. When patients reach this stage of tooth decay, the tooth sensitivity is far more pronounced. Simple biting and chewing can also trigger serious tooth sensitivity. The ideal treatment for dentin decay is the use of more substantial dental restorations, such as inlays, onlays, or crowns. These can all help rebuild larger portions of seriously damaged and decayed teeth. Inside of every tooth is a chamber full of dental pulp. This soft tissue in the tooth was essential for the tooth's initial formation and maturation. If the oral bacteria reaches the dental pulp, a painful infection occurs. This is known as a root canal infection. To treat a root canal infection, endodontic therapy is necessary. This process involves the removal of the diseased dental pulp, sterilization of the pulp chamber, filling in the tooth with an inert material, and capping the treated tooth with a dental crown. When a root canal infection is left untreated, it can lead to the formation of an abscess. An abscess is an accumulation of pus and debris. If the abscess ruptures, this can have serious consequences on your oral health and general wellness. To treat an abscess, it must be professionally drained to ensure safety throughout the process. The use of antibiotics is common after the drainage of the abscess to help eliminate any remaining harmful bacteria. If you would like more information about treating and preventing tooth decay, be sure to contact our cosmetic and restorative dentistry center today. We look forward to your visit and discussing all of your treatment options in much greater detail.